↑ "Reconstruction and Fusion: Jefferson Davis on race and slavery in his memoirs, no lessons learned". Confederate Truths: Documents of the Confederate & Neo-Confederate Tradition from 1787 to the Present. 2013. สืบค้นเมื่อ February 18, 2013. 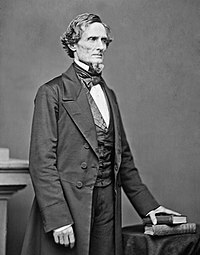 ↑ "The Anti-Secessionist Jefferson Davis". National Park Service. สืบค้นเมื่อ 2015-07-27. ↑ Cooper 2000, pp. 70–71. ↑ Strawbridge, Wilm K. (December 2007). "A Monument Better Than Marble: Jefferson Davis and the New South". Journal of Mississippi History. 69 (4): 325–347. หน้านี้แก้ไขล่าสุดเมื่อวันที่ 11 สิงหาคม 2559 เวลา 20:39 น.